Do you need extra help for EL students? 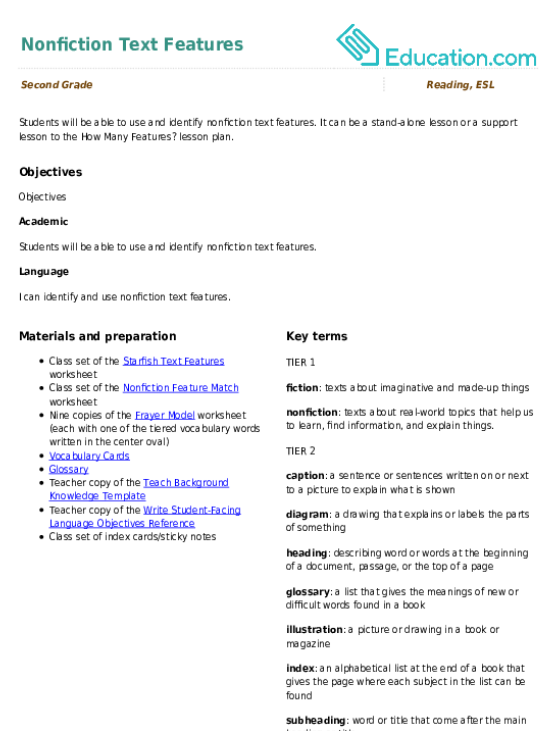 Try the Learning About Text FeaturesPre-lesson. Students will be able to identify the main purpose of a text, including what the author wants to answer, explain, or describe. Get out a variety of nonfiction books to provide students with concrete examples of different reasons an author writes a nonfiction book. For example, display a book that explains how to do something, a book that explains or informs, a book that entertains, and a book that persuades someone to believe something. Show the students the covers of the books and ask them what they all have in common. Illicit ideas from the students by turning the pages of the books, and bring attention to the fact that many nonfiction books have real photographs. Explain to students that NonfictionBooks, or texts, are about real life and authors write them for different reasons. Show the students the covers of at least four nonfiction books, and allow them to make guesses about why the author wrote the book. Write the following learning objective on the board in student friendly language: "I can identify the main idea of a nonfiction text, including why the author wrote the text!" Read the learning objective aloud and ask students to choral chant the learning objective back to you. Define NonfictionIn student's home language (L1). Provide a word bank in English and L1 to help students answer the prompts. Intermediate:Provide students with the following sentence starter: I think the author wrote the book because ____. Explain to students that the author's PurposeFor writing a nonfiction book or text is what they want the reader to gain from reading their book or text. Bring out a nonfiction book that teaches how to do something (e.g. how to make cookies or cook a pizza). Explain that this particular book was written to teach you how to do something. Explain to students that some nonfiction books or texts are written to teach us about a topic, some are written to persuade, or convince, the reader to believe what the author believes, and some are just written to entertain, or engage, the reader! Tell the students that today they will be reading a short nonfiction text about oceans. Ask students to predict what the author's purpose will be for writing a text about oceans. Read each purpose separately and ask students to raise their hand when they hear the author's purpose they believe the ocean text was created for. Mark tallies next to each purpose on the board, and review which purpose has the most tallies and the least tallies. Provide students with the author's purpose written on four note cards in English and L1. Allow students to hold up their answer about the author's purpose using one of the note cards. Intermediate:Provide students with the following sentence starter to answer the question: I think the author wrote a text about the ocean because ____. Project The Ocean worksheet on the board and pass out copies to each student. Call on a student volunteer to read the directions at the top of the page. 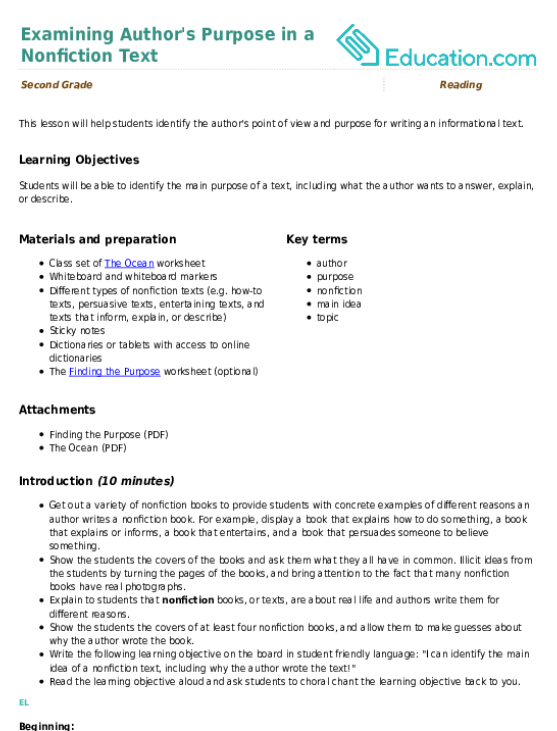 Ask students to look at the picture included on The Ocean worksheet. Call on a student to offer an idea about the topic of the text, explaining that the TopicIs a word or phrase that explains what the text is about. Clarify that the topic of this text is the ocean. Read the first paragraph aloud and bring attention to the bolded words in the text. Explain to students that authors often include vocabulary words that help support the main idea of the text. Define Main ideaIn student-friendly language by explaining that the main idea is what the author wants the reader to learn about. Explain to students that the main idea is usually a sentence within the text. Underline the first sentence of the text, and explain that this is the main idea of the text: The ocean is important to all living things. 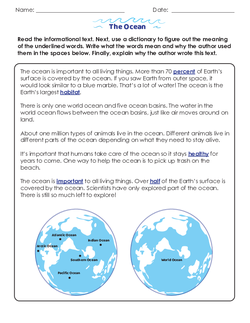 Have the students underline the main idea on their copies of The Ocean worksheet. Continue reading the text aloud and call on student volunteers to help you. Bring the students' attention to the bottom of the page and read the sentence frames aloud. Model filling in the first sentence frame by inserting the word "percent." Using an online dictionary, look up the word percent and write down the definition on the worksheet. Next, ask the students why the author included the word percent twice in the text. How does the word percent support the main idea of the text? Allow a couple students to share out. Reinforce that the author included the word percent to help the reader visualize and understand how much of the Earth is covered by ocean. The author wants the reader to understand that the ocean is important to all living things. The author also wants to help the reader understand that there is still more ocean left to explore. Model recording your answer using the sentence starter on number one. Pass out dictionaries or tablets with access to an online dictionary, and split the students into partners. Ask students to finish filling out the sentences for numbers 2–3 on their worksheet with their partners. Provide students with a simplified (both in complexity and length) text in English and L1. Allow students to work in a small teacher-led group and read the text aloud to a teacher. Pre-select two simplified words for the students to define in English and L1. Intermediate:Encourage students to summarize the text aloud to their partner after reading each paragraph. Have students go back to their seats and finish numbers 4–5 on their worksheet independently. Beginning:Allow students to continue working in a small teacher-led group to define words. Intermediate:Allow students to work with partners. Support:Allow students to work with a partner during independent work time. Enrichment:Allow students who finish early to pick out a nonfiction text at their reading level and determine the author's purpose, including finding important vocabulary words that help them understand the main idea of the text. Ask students to use the Finding the Purpose worksheet to record their answers. Read the question at the bottom of the worksheet, and ask students to bring their attention back to the information about the author's purpose written on the board. Review which author's purpose most of the class chose prior to reading the text. Explain that now that students have read the text, you want to see why they think the author wrote the text. Ask them to think back to the main idea of the text. Record tallies to represent each student's choice and compare the findings from before and after reading the text. Have students record their answers to the question at the bottom of the worksheet as a formative assessment. Allow a few students to share out when they are finished and collect their worksheets. Beginning:Allow students to respond orally. Intermediate:Allow students to work with a partner to finish the bottom of their worksheet. What was the author's purpose for writing The Ocean? How do you know? Using two of the vocabulary words from The Ocean, explain something new you learned. Why is it important to understand the author's purpose for writing a nonfiction text? How does this help you as a reader? Beginning:Ask students to orally share one thing they learned from the text. Intermediate:Allow students to respond to one of the prompts. 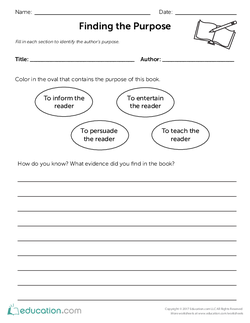 Use a stand alone activity or a support for the Examining the Author's Purpose in a Nonfiction Text lesson. Help your year three students identify the author’s purpose as they answer questions about a nonfiction text. 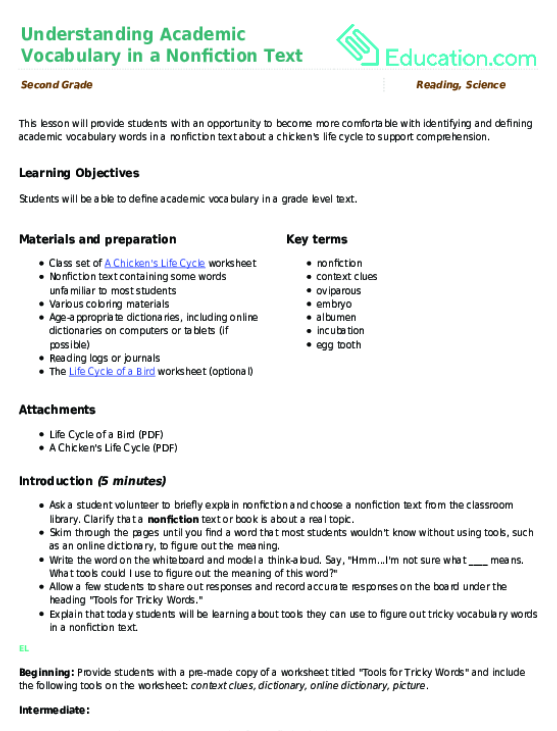 Use this glossary with the EL Support Lesson Plan: Summarize a Nonfiction Text. Use these vocabulary cards with the EL Support Lesson Plan: Summarize a Nonfiction Text. 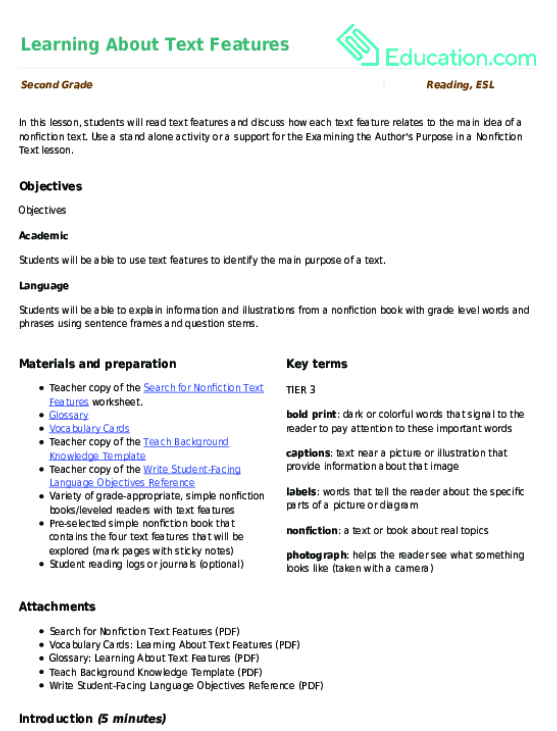 Use this glossary with the EL Support Lesson Plan: Nonfiction Text Features. Provide your students support as they work on improving their reading comprehension skills by creating a nonfiction text summary.